Tell me if this is just me. Is it normal to look at food pictures all day long and literally find yourself continuously scavenging through your cupboards trying to find something...anything...to eat that will satisfy this new hunger and specific taste you now need from looking at said pictures? Is it normal to have this happen over and over again throughout the day? I kid not. Food...is my weakness. I could have eaten a HUGE meal, picked up a food magazine or hit up a food blog, and literally 5 minutes later I find myself CRAVING that very dish I'm googling at. Melted cheese?? Golden brown crusts?? Chocolate shavings or dripping sauces?!? Geez Louise, it makes my mouth water. Every time. 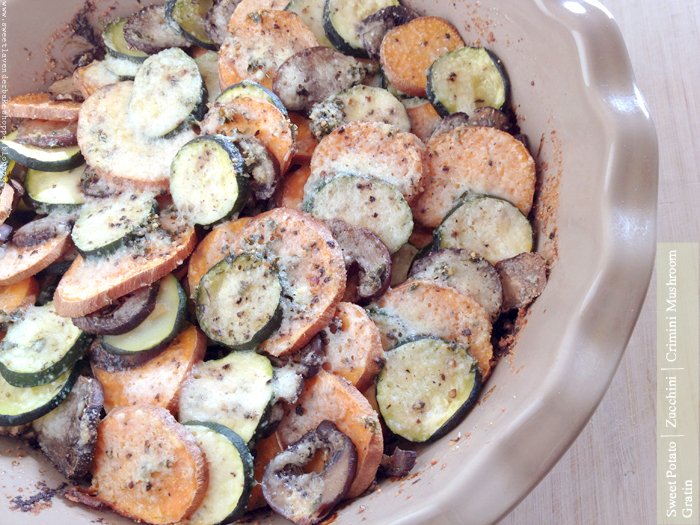 One of my favorite blogs, Deliciously Organic did a little post on "Vegetable Tian" a little bit ago. It instantly made me crave/want/need cheesy and salty goodness. Oh, did I mention I was looking at this while finishing up a huge lunch? Sigh. So I bookmarked it..errr pinned it. <--Honestly....who "bookmarks" anymore? :( So like I was saying, I pinned this recipe and tried my hardest to tell myself to wait until dinner time to make it. Things would be too weird in the Main house, had I gotten up from lunch only to search through my food supply and start making more food. Our cats are major judgers. I wouldn't want any of that going on. So, I made myself wait. Carrie uses tomatoes (she made it as a summer dish), but I've incorporated more "fall" like vegetables to satisfy my never ceasing autumnal palate. The smells that come from your oven while this bakes....are...gosh..amazing?! ?...but also enough to make any mouth water. Even if you've JUST eaten...like me. 1. In a small sauce pot or sauté pan, add your olive oil, coconut oil, chopped fresh thyme, garlic, salt and pepper, and gently heat over medium low heat. 2. Allow oils to begin to cook the garlic and thyme. As soon as a gentle bubbling/sizzling begins, turn heat off and allow to infuse in pan- about 10 minutes. We're not looking to really cook the herb and garlic, rather warm it up- thus allowing it's fragrance to permeate throughout the oil. 1. Preheat oven to 375*F and grease a 9" pie dish with some of your infused oil. Of course you can use a glass or metal baking dish, but I chose to use a ceramic pie dish for a fancier look. 2. 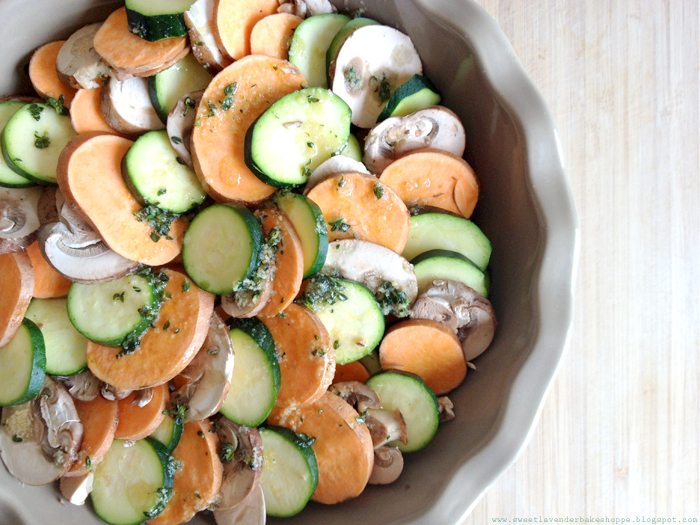 Arrange sliced vegetables in a single spiraling layer around bottom of pie dish (as shown in picture above), alternating with each type (i.e. 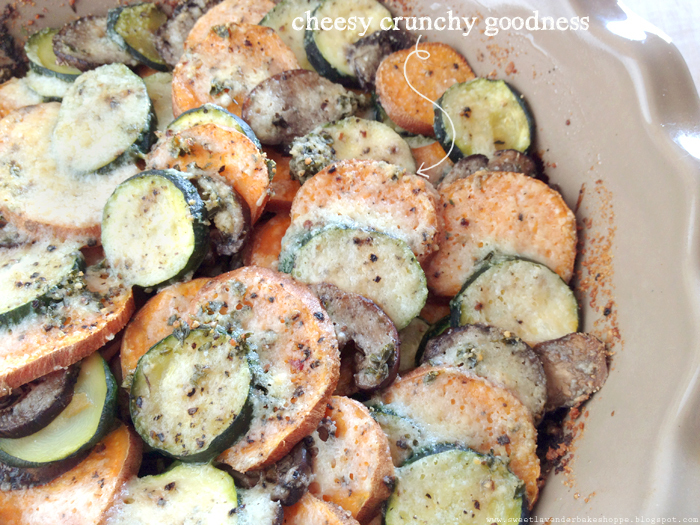 a few slices of sweet potato followed by zucchini and then crimini). Drizzle or brush a little of your infused oil over top of that layer, making sure to include some thyme and garlic! 3. Continue layering in this same way- spiraling layers of alternating vegetables, drizzled with oil, until all of your vegetables are used. 4. Top the whole gratin with your pecorino (or parmesan) cheese and drizzle any remaining infused oil (and herb/garlic) over that. 5. Bake for 30 minutes, covered and then remove covering and bake an additional 10-15 minutes or until cheese is golden brown and vegetables are cooked tender. *Will shrink down a bit once cooked. I'm not even joking when I say this is the best vegetable dish I've ever eaten. 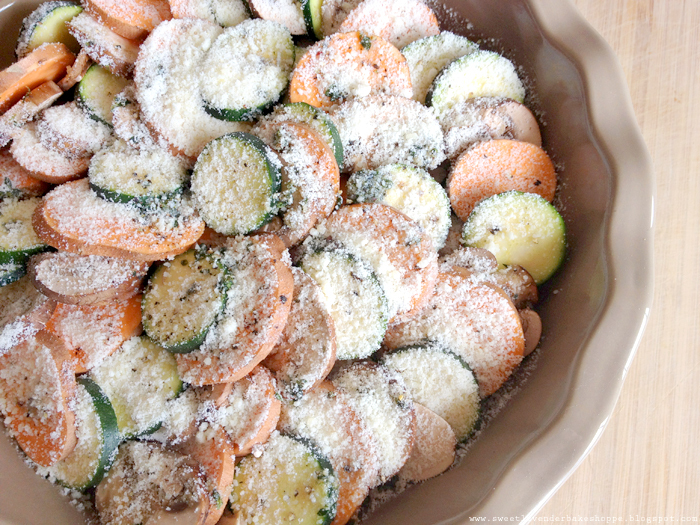 The thyme and garlic infused oil gives the whole gratin an earthy heavenly aroma and taste. Then the pecorino cheesy topping makes every single bite pop with a salty kick. It's amazing as a vegetarian dinner for two and just as good as a vegetable side for a party of 4. I'm thinking this needs to be at our Thanksgiving dinner table, alongside that beloved Green Bean Casserole. Would you look at these beauties?!?!?! The stamps, that is. I'm so so so excited to have these guys in my home! Since I'm always trying to find neat ways to brand myself (and make my Etsy packages look super cute) I knew I wanted rubber stamps of some sort. Thing was...I couldn't for the life of me decide what it was I actually wanted. So I sat on the idea for months. Finally I buckled down and made a decision. Now looking back on it- I seriously don't know why it took so long...what was my issue?? I know, I know- duh Christina, your logo is the perfect thing to have. BUT when there's an infinity of ways to go...and you don't want to spend a million dollars on stamps, one must think very wisely and precisely! But honestly, of course one's logo would be like...Stamp #1 to get. Don't ask what was going on. Any who, I found the perfect person to make them too! This lovely shop not only had incredible prices (rubber stamps can be pricey!) but made the perfect stamps for me! EXACTLY what I wanted. She was super nice and super easy to work with. 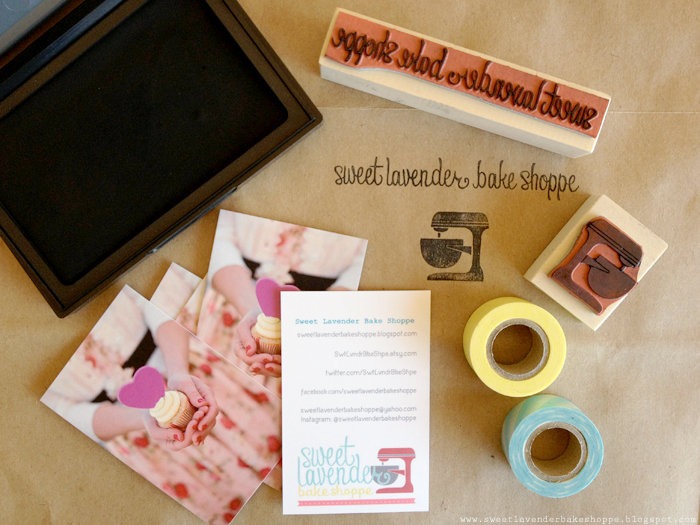 If you're in the custom rubber stamp market, I highly recommend using Happy Rainy Day! Okay, now I'm craving this!! It's so hard (and so amazing) to look at food blogs all day. Thanks for sharing!